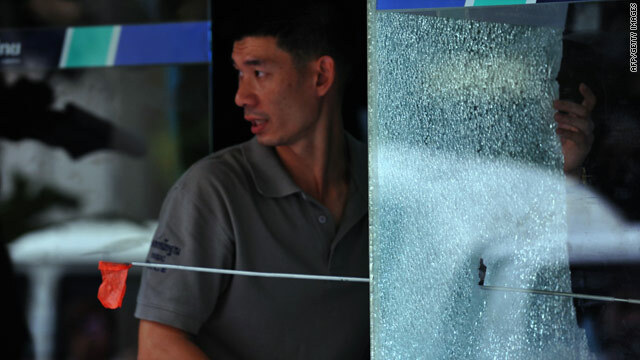 A Forensic expert inspects the site of a shooting attack at a local commercial bank's ATM booth on Silom road near to the Red Shirt anti-government protesters' fortified camp in the financial central district of Bangkok on May 8. Bangkok, Thailand (CNN) -- Two Thai police officers were killed and eight people injured in overnight violence that lasted into early Saturday in areas where anti-government protesters are camped out. The first attack -- a drive-by shooting -- killed two police officers. It occurred in an area guarded by riot police in Bangkok's business district, the government's Erawan Emergency Center said. Later, early Saturday, several grenades were launched toward police and military guarding an area where protesters were camping in the capital, according to the emergency center. That attack injured eight, the center said. Thousands of anti-government protesters have brought the center of Thailand's capital to a standstill for a month as they seek to unseat Prime Minister Abhisit Vejjajiva's government, which they say is illegitimate and undemocratic. Abhisit has called the accusations "unfounded." The demonstrators -- known as "Red Shirts" because of their clothing -- support Thaksin Shinawatra, who was prime minister from 2001 to 2006 before he was ousted in a bloodless coup. Leaders of the anti-government protesters announced Tuesday that they had reached a deal with the government but said they would not end their demonstrations until the prime minister announces when he will dissolve parliament.